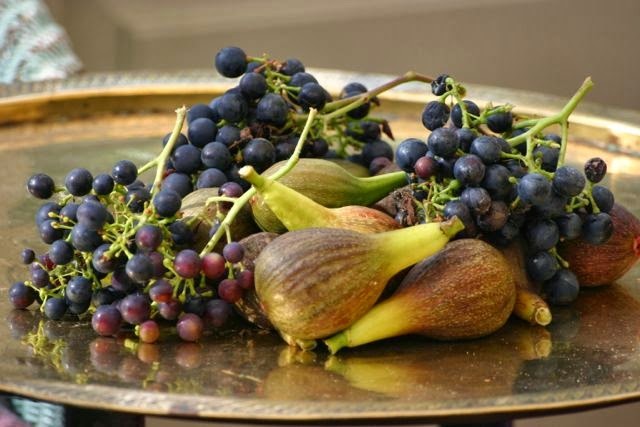 Hi Jane, well, the figs together with the blue grapes on the silver plate look extremely delicious to me and in my house they wouldn't have survived there for long. I looove figs! I think you have chosen an interesting tree for the meme. It surprises me very much that it has survived temperatures of minus 12 C and that it grows so well despite neglect. Maybe it is meant to be YOUR tree. You just have to start eating its fruits, at least once ;-)! Happy spring gardening! Hi Christina, it is ridiculous not to eat them , we do this with all sorts of stuff we grow ! It shall be my spring resolution ! Happy spring gardening to you too! The meme sounds interesting but I'm not disciplined enough to stick to a monthly routine. Forgoing routine was one of the advantages of leaving work. Figs are tough - of you search my blog for fig you can read how we thought ours was dead only for it to come back even stronger. Hi Sue, I hope I can remember to post regularly ! I will pop across and look out that post about your fig tree. It seems you have the perfect place for your fig, if inadvertently. The wall is something special too! Hi Lucy, your meme is really flying, by the look of it ! Yes, I must have intuitively done the right thing ! 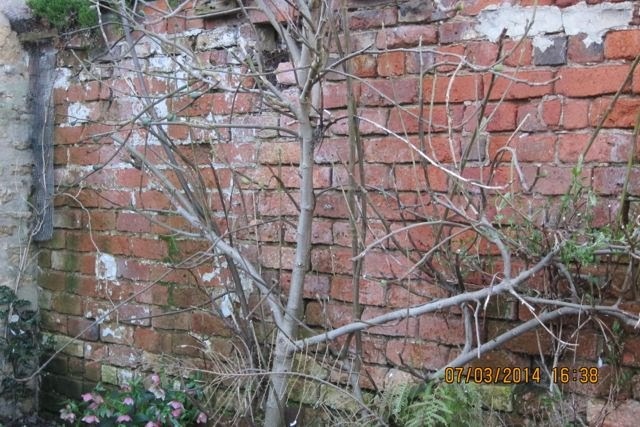 I am so lucky to have lots of old stone and brick walls to use for tender plants and climbers. The house and garden were a smallholding/ market garden way back when, so there are old outbuildings etc. It is, isn't it! I think we've all been pleased and inspired by the enthusiasm of everyone's response. The challenge now will be to keep it up. But with so many people involved this year, that shouldn't be difficult. After all, we will all be wanting to find out 'what happens next'! I like the idea of this meme. I also enjoyed your thought process for eventually arriving at fig. I would have gone for the same trees as you did, then changed my mind too. I look forward to reading about your fig tree - at last, its time has come and it will be the most photographed fig tree in the land. I look forward to following its progress. Hi sarah, it is interesting isn't it, the whole thing around blogging, that you start off with one intention (i.e. to photograph a tree for a good meme) and end up with something much richer (being a better gardener, particularly with respect to said tree!). What a wonderful choice of tree to show each month, I will look forward to seeing all the differences each time. Hi Pauline, there is a huge diversity of trees chosen by different people, over at 'Loose and leafy'. It is going to be interesting, as you say, to flow the changes through the seasons. So I am not alone then Stephanie, letting fruit stay where it is! Yes, Spring if wonderful - almost worth going through a dreary winter for ! I certainly hope you will eat the figs this year, now that you have paying close attention to the tree! It never ceases to amaze me that you can stumble into success, as you did with this fig tree, whereas other times you take meticulous care, do everything right, and the plant still dies. Nature. Go figure. Hi sarah, I know ! This one has certainly thrived on neglect! I have managed to kill so much with kindness too !I think it comes back to the old adage of the right plant for the right place. Often the ones we have to nurtue are way out of their comfort zone. Glad to read you are now getting to know your fig better Jane - already you've benefitted from the theme of the meme! All win win so far as I can see. I'm not a fan of figs myself but think this should be the year of tasting your own crop. 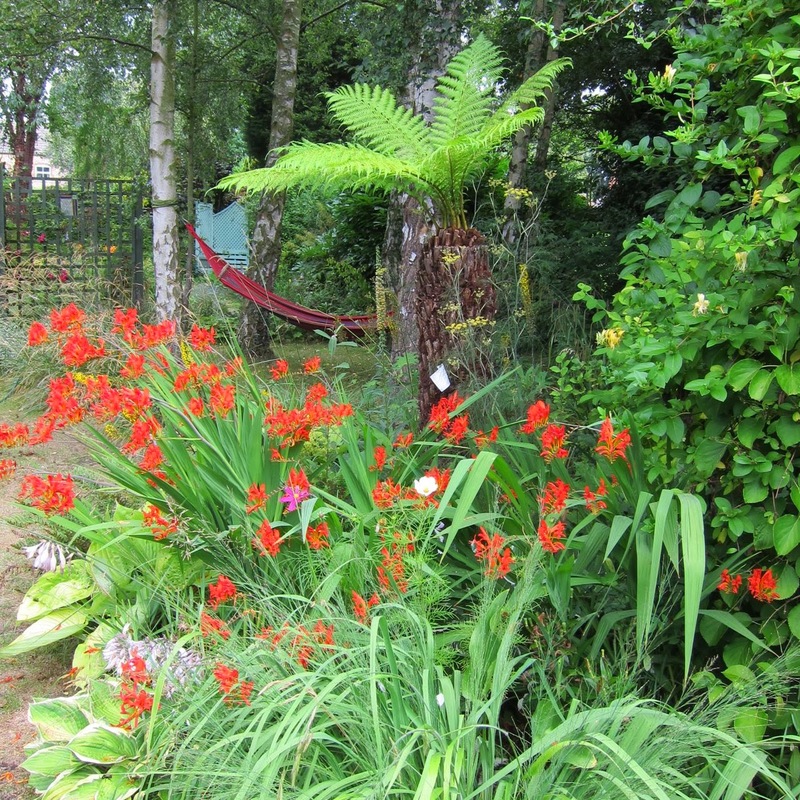 A plant that thrives on neglect is a must for any garden! Hi Angie. Yes, the meme is working its magic already! Are you taking part ? I haven't had time yet to have a look at the others who are doing it, and pop across to their blogs. One of my favourite short stories is about a fig tree and the old Italian-born Canadian gardener who buries it in a tunnel every winter. Fig trees are not at all hardy here although last year I remember seeing a new cultivar that can over winter in a garage or other similar cold, dry place. It is interesting that your fig has survived on neglect. Nature has a way of always surprising us. Maybe this is the year that you will finally sample its fruit. Hi Jennifer. Who is the story written by ? Sounds interesting. I wonder what the new hardy variety is . 'Brown Turkey' is the hardiest one available here in the uk, to my knowledge. I'm also tree following. I thought I loathed figs, my only experience being the fig newton biscuit. Then I stayed at a friend's place who had a fig orchard, she encouraged us to pick and eat. Nothing like a fresh, ripe fig picked warm from the tree. I think Jennifer is talking about "The Vinyl Cafe" series of radio programmes and books. Wonderful stories and the fig tree is one of my favourites too. Hi Susan. Yep, I too have grim memories of the Fig Newton ! Enough to put you off for life ! I will check out 'The Vinyl Cafe'. Which tree have you chosen to follow ? I will pop over and have a look! I'm going with my Cox's Orange Pippin. It is hard to grow well on this side of the pond and consequently not seen often. When we bought this property I had no idea there were two COPs in the meadow. I was thrilled. A lovely tree and very tasty apples! That must have been a fantastic find ! It will be interesting to me to follow your tree. I, too, have a Brown Turkey fig, and love it. But I've never eaten a fig off of mine, either. Mine fruits around November (very late fruiting, or perhaps it's second fruiting? ), and the fruits get frozen on the tree. So, this year I've decided to pay more attention to it and determine if it's just late every year or if I've missed the first fruits and the creatures are getting to them first! Your posts will remind me to pay more attention to mine! I love figs and really want to eat them! Hi HolleyGarden, yours sounds like a parallel story to mine ! We need a resolution to eat our own figs this year ! As you say, maybe the focus of the meme will encourage us to look more closely at the tree and how it is progressing. Good idea for a meme. I adore fresh figs. Dried figs too, come to think of it. As a favor, so you wouldn't feel guilty, I would absolutely go over to your house and take all those figs off your hands. If I only could. Supposedly there are figs that are hardy here but it's a very risky prospect. Oh you are too kind ! We will have to do it all virtually!! "Feed in early spring by spreading 70g (2oz) of a balanced granular fertiliser (such as Growmore or Fish, Blood and Bone) over the ground, and cover with a thin layer of well-rotted manure. When the fruit appear, feed weekly with a high-potassium liquid plant food (such as tomato fertiliser)." You'll get bigger fruit if you follow this advice. Well rotted manure!! hey, don't neglect your Fig. I think this is a great meme which makes you really look at a tree over a period of time. A fig is a great choice. I hardly ever look at mine except to wonder why it always gets those little tiny figs at the wrong season which never mature. You get nice ripe figs and don't eat them? Maybe this year you will eat them, because if you don't you will have people from all round the world wanting to know why not. Hi Chloris , good point ! I will be shamed into eating them ! Like you I have lots of little knobbly ones which don't do a lot ! I will investigate that for the next meme post!! Hi Miss Linda - I am hoping my knowledge of fig trees and how to look after them will deepen as time progresses ! It is interesting how the process of selecting a tree brought on a new appreciation of your fig tree. I also grow one but, being in Ontario, I take it in a cellar for the winter. I don't know what I will do when it gets too big. The variety (Chicago) is supposed to be hardy but I doubt it is. I remember seeing a fig tree bending under the weight of fruit in Victoria, B.-C. 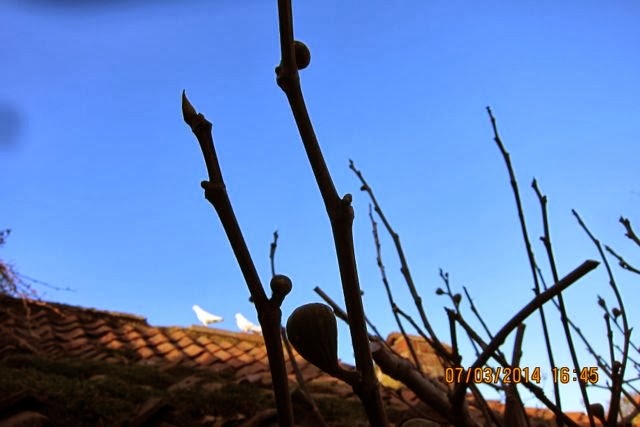 However, though the climate is very mild, it does not get hot enough for figs to ripen and none of the numerous fruits were ripe, even if it was November. What a shame there is not enough heat to ripen the figs, Alain. 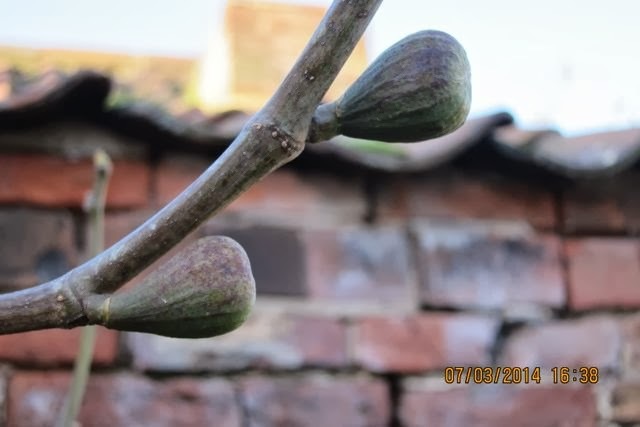 Interesting because our climate here in the uk is mild of the most of the time, but rarely gets very hot, even at the height of summer, yet our figs ripen, particularly in a good summer. Can you grow outdoor grapes ? We can grow some hardy varieties, if the right planting spot is chosen. Yes, we can grow some grape varieties. In the last 40 years many roses and grapes varieties have been developed for cold climates like the northern US and Canada. I do grow a variety of grapes called Coronation. It does very well but has to be picked the moment they start to ripen otherwise raccoons get them. I was wondering if figs could ripen in the UK. The tree I saw in Victoria (which must have a climate similar to Bristol's) was not against a wall but in the middle of a circular bed. I expect the fruit would ripen on a wall. I have always fancied growing a fig as I do quite like them but unfortunately my damp shady garden is just not suitable. 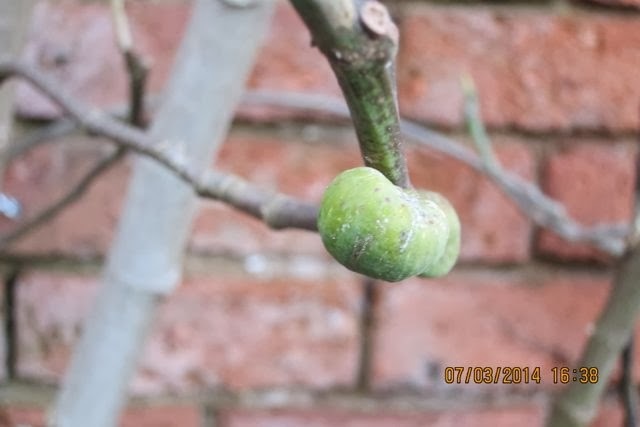 I grew up with a fig tree in the garden. Will be interesting to see how yours grows. My TF tree is a Silver Birch ... here. Hi Caroline, will hop over and take a peek ! 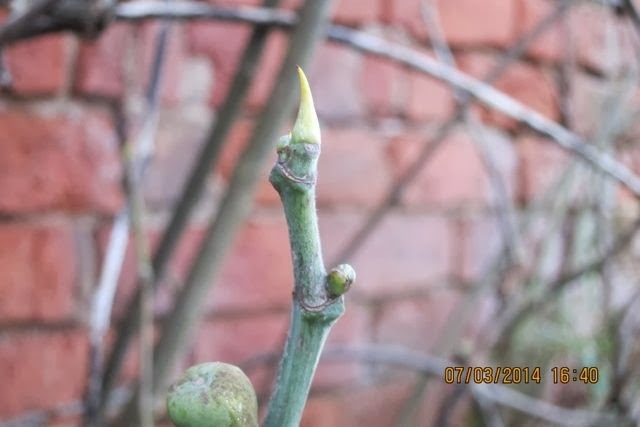 My fig is currently not happy ! Go on ... liberate that fig tree !! Then it will give you oodles of figs which you can pick, put in a dish and leave until they go too soft to eat... then put them on the compost heap. Oh no ... hang on ... that's me, that's what I do ! Oh, lucky you having a fig tree that produces well! I love fresh figs and used to be able to pinch a few from a tree growing in the plots at a nearby City Farm. It got pruned rather too severely a couple of years back and is still in recovery … maybe this year, though … !